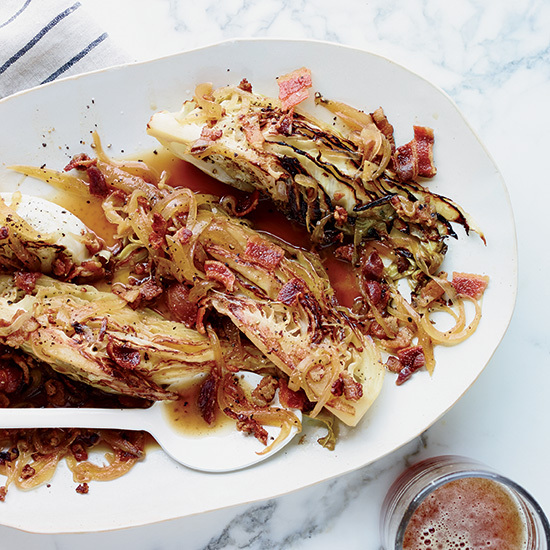 Tom Colicchio shares one of his favorite ways to prepare cabbage: bacony and braised in apple cider. The chef and Top Chef judge shares one of his favorite ways to prepare cabbage: bacony and braised in apple cider. For years, Tom Colicchio has been one of the food world’s most avid fishermen. Now he’s found a new passion: growing vegetables. “It’s cutting into my fishing time,” jokes the Top Chef judge and F&W Best New Chef 1991 about work on the ever-expanding garden at his house on the North Fork of Long Island in New York. Colicchio shows his love for vegetables at all of his restaurants, including his flagship Craft in New York City, where this hearty braised cabbage is a favorite. He cooks the green cabbage with bacon and both apple cider and apple cider vinegar until it’s tender, tangy and sweet. Vegetables will also be the focus when Colicchio opens Beachcraft at 1 Hotel in Miami’s South Beach. Will he start a garden in Florida? “I’m thinking about it,” he says. Craft, 43 East 19th St., New York City; craftrestaurantsinc.com. Get the recipe for Tom Colicchio’s Apple Cider–Braised Cabbage Wedges.